Looking towards decentralizing the social impact space, we started considering ways in which Bounties could help incentivize and organize positive global action across key UN initiatives. Having considered mechanics and usability, we launched the first bounty-based social impact project in partnership with MakerDAO back in June 2018, on World Oceans Day. The original bounty is very simple: pick up trash wherever you are, submit verifiable proof that you have done so, and receive 10 DAI as a reward. Upload a photo of yourself with trash you have cleaned up from a park, beach, street, riverbank etc. Check out the full details of the bounty and how you get started if you’d like to get involved. The DAI bounty is still up and you can submit your cleanups. Specifically for the Philippines pilot, we recreated the bounty with an ETH payout in order to simplify the flow and enable a smooth coversion from ETH into Philippine Piso for the participants wanting to do so. 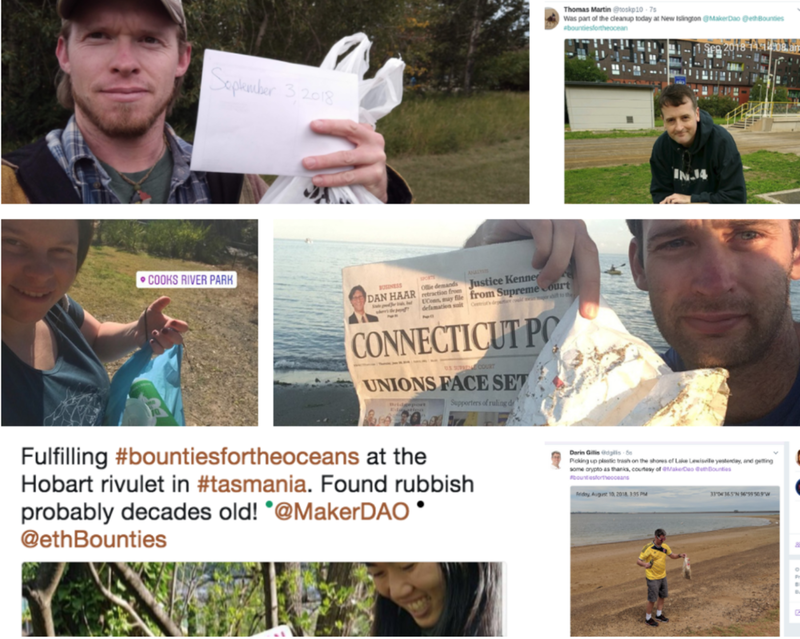 Since its launch in June, we have seen cleanups happen across the world, from the US to the UK, from Canada all the way to Venezuela and even Tasmania. Most of the people participating in our initial bounty were new to the blockchain space when fulfilling the bounty. It is this power of activating and empowering individual action that is most appealing about the model. The video below was shot on #WorldEnvironmentDay 2018 by Ian Redmond OBE, Ambassador for the UN Convention on Migratory Species, at Las Pinas-Paranaque Critical Habitat & EcoTourism Area in Manila Bay. The footage shows a volunteer cleanup happening in June this year and the need for further action is plain to see. Our goal with the bounty-based cleanup in Manila is to re-engineer the flow of money and its distribution patterns, bridging the gap between social entrepreneurs, non-profit/NGOs and the general public. Fostering widespread and long-term behavioral shifts on a global scale will directly benefit communities, like Manila, that are intensely and increasingly affected by plastic waste. This new mechanism could also help create new jobs andvastly reduce the burdensome administrative costs afflicting most charity models today. The overall plans extend far beyond this one project however. Imagine a borderless decentralized social impact contribution network — not only would a network like this drastically reduce the friction involved in global impact projects, but it would give individuals and organizations the tools to incentivize and activate millions of hours of human capital to collaborate towards positive social and environmental outcomes. As part of the pilot, we are also partnering with Coins.ph on the ground so that the people participating in the cleanup can exchange their ETH into Philippine Piso and use the money to pay bills or buy groceries. The importance of having the full money flow loop is key when it comes to bridging the gap between crypto and the current financial setups. Coins.ph also offers cardless cash out from a wallet at any Security Bank ATM nationwide in the Philippines — a key requirement for working with the unbanked segment of the local population. As this is a time to create, test and improve, we will be documenting the pilot experience and results to try and understand what the implications and effects of running social impact projects on Ethereum are. Our goal is to demonstrate feasibility, and hopefully, kickstart a powerful world-changing trend where blind trust is no longer a concept. Proof of action is. Blind trust is no longer a concept. Proof of action is. The second phase of the project will be the recycling & manufacturing of a product out of cleaned up plastic. Another cleanup in another region would see the bountied plastic be transported to a facility capable of turning plastic into fibre. Ideally this facility would be local to the cleanup area to limit carbon footprint. The fibre would then be used to produce an item of clothing/footwear and be sold through a retailer. The funds raised would be put towards more social/environmental impact projects on the blockchain. We are committed to collaborating in finding solutions for improving the world together so please join us, contribute to the bounty or sign up as a volunteer! Become a part of our Bounties Slack community, sign up to our emails andfollow us on Twitter to follow all Bounty-based social impact progress. My heartfelt thanks to everyone on our fully remote, fully collaborative, team and to everyone taking part in this initiative.